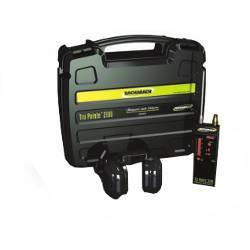 Bacharach Tru Pointe 2100 Ultrasonic Multi-Purpose Inspection System. Uses two software-controlled sensors for the detection of airborne leak sounds and solid-borne sounds from leaks and bearing wear. Detects ANY gas leaks. AudioZoom volume control. Includes Behind-the-Head Headphones. Optional SoundBlaster. The Tru Pointe 2100 is an advanced electronic ultrasonic leak detector and condition monitor used by maintenance personnel for leak detection, preventive and predictive maintenance (PPM) and scheduled maintenance in a variety of industries. Using patented signal processing, the Tru Pointe 2100 the most accurate and repeatable ultrasonic inspection instrument in its class. The Tru Pointe 2100 is extremely sensitive to the "sound" of leaks and friction in commercial and industrial systems and provides the most precise readings available. The operating principle of the Tru Pointe 2100 is based on the detection and measurement of ultrasound and its conversion into audio for humans to hear using a technique called heterodyning. Ultrasound is generated in leaks, external & internal, friction in bearings & mechanisms, faulty steam traps and valves. The Tru Pointe 2100 will help locate problems by detecting the ultrasounds they generate. The first of its kind, the Tru Pointe 2100 uses two software-controlled sensors for the detection of airborne leak sounds and for the detection and location of solid-borne sounds from leaks and bearing wear. For ease of use and interpretation, the Tru Pointe 2100 has two digital LED displays - a 20-segment bargraph display with peak hold and an alphanumeric display for instrument settings and precision measurements. The Tru Pointe 2100 detects air and gas leaks in two frequency bands for isolating leaks; 26 kHz-34 kHz (low) and 34 kHz-42 kHz (high). Using the patented internal Touch Probe sensor, the instrument detects internal leaks in two ultrasonic bands: 16 kHz-24 kHz (low) and 34 kHz-42 kHz (high). Additionally it has the capabiity to function like a stethoscope, using an industry-exclusive acoustic band. 0-10kHz. Capable of detecting a 5 PSI leak out of a 0.005" hole, 30 to 40 feet away (depenriig on background noise). Capable of detecting ANY gas leaks, regardess of chemical property or concentration. Ideal for steam trap testing, detecting bearing wear, gas and valve leaks. 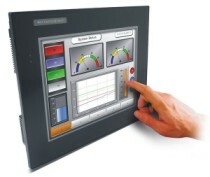 Unaffected by wind or temperature fluctuations, other sounds or gases in the test area. Kit includes the Tru Pointe 2100. high-quaity noise attenuating headphones. 6" Touch Probe, segmented 3' extension Touch Probe. 6" Wave guide- packed in a hard plastic carrying case. When combined with the ultrasonic sound generator, the SoundBlaster, the Tru Pointe 2100 can detect leaks from tanks, enclosures, building doors & windows, automobile windows & windshields, walk-in coolers, clean rooms ship hatches and compartments. > LEAK DETECTORS > ULTRASONIC : 3 Items found. 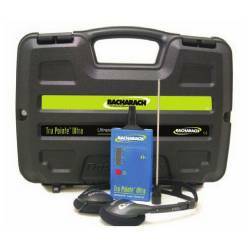 Bacharach Tru Pointe Ultra Ultrasonic Leak Detector for all type of gases including Nitrogen (N) and Refrigerants. Based on the detection of inaudible high frequency sounds produced by flow gases. LED Bar graph. Includes folding Headset. Optional Soundblaster. Bacharach Tru Pointe Ultra HD Ultrasonic Leak Detector for all type of gases including Nitrogen (N) and Refrigerants. Based on the detection of inaudible high frequency sounds produced by flow gases. LED Bar graph. Includes Stereo Headphones. Optional Soundblaster. 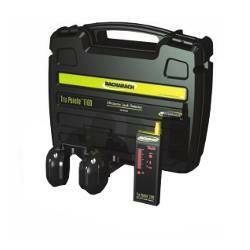 Bacharach Tru Pointe 1100 Ultrasonic Leak Detector with two independent sensors for internal or external leaks. Detects any gas (compressed air, refrigerants, nitrogen, CO2, helium, vacuum and many others). AudioZoom volume control. Includes Behind-the-Head Headphones. Optional Soundblaster.